Since we had been on vacation for a couple of weeks, and then I was in charge of Vacation Bible School at our church, Emmy’s birthday party was planned at the last minute. Our guests arrived, and we had a wonderful celebration with BIG BUBBLES for my BIG GIRL! 12 Responses to Birthday Cake! Wow! I'm impressed that your husband made a cake! Mine barely makes mac 'n cheese! Recent blog:=- Birthday Cake! So sweet! Happy birthday to the big girl and that is a lovely looking cake!Recent blog:=- HASAY: Sometimes, being bad can be good. That cake is awesome! I couldn't do anything that creative at all. Hubby made my son's last year and wants to do it again this year. He did a great job, so what can I say? Nuthin' :-)Welcome back from vacation!Recent blog:=- My mom's important message to us all. 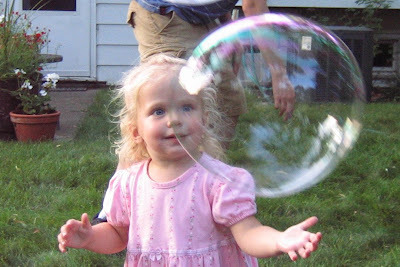 . .
Emmy loves bubbles! :-DRecent undefined:=- Oh no! Comluv had an error with your feed, see message below!